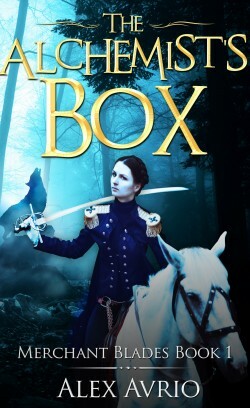 Indebted on the flip of a card, Captain Regina Fitzwaters and her band of mercenaries are forced into a job: retrieve the mysterious Alchemist’s Box from the southern Duchy of Pella. Having to take a former enemy in the recent bitter war as her second, Regina must quickly determine who she can trust with her life, and who should be run though with her saber. A journey through snowy passes frequented by bandits and wolves is nothing compared to the dangers that lie in wait in the sumptuous court of the Duchy. In Pella, a curse of a thousand years has resurfaced. Where are all the court dignitaries? What does the Alchemist’s box contain that is worth killing, or dying, for? Can Regina and Jaeger put the war behind them and work together to save everyone in the Duchy before it’s too late?